Perhaps you have seen a tank on wheels similar to this one in a garden center, office or indoor garden. It is called a water machine and they are very common in the interior plantscapng business. Perhaps more visible to consumers are the water machines used in Home Depot, Lowe's and independent garden centers. The entry level price for professional water machines is about $1,000. Obviously not a retail consumer product unless you are a 1 percenter and if so you probably have a gardener. In addition to the sub-irrigated balcony pollinator demonstration garden I am also creating a new urban greenscaping lab studio complete with rolling rack light gardens. I have been experimenting and researching better ways to grow both decorative and edible plants using indoor light gardens for about 18 years now. They have provided a wealth of open source information about sub-irrigated planters, methods and tools. For example, replenishing the water in sub-irrigated planter reservoirs saves a lot of time and water as compared to watering the same number of plants in traditional drain hole planters but it's still a physical chore. Lugging water around in utility trays holding 8 recycled plastic milk bottles is physically demanding. Each tray of 8 plastic half-gallon containers weighs over 66 lbs. Remember the old water weight phrase..."A pint's a pound the world around?" My back remembers it. It is long overdue that I find a better way to haul water. Here it is via a couple of products from Amazon. Incidentally I do not get any money from Amazon links. There is no revenue generated by this blog or the plant research lab. As you can readily see this is a Hydroller portable water tank from Amazon via Reliance Products ($25.97). Its primary use is by campers. The battery operated (2 AA) pump sticking out of the tank is also from Amazon by way of TeraPump.($19.99). To extend the length of the hose just add a length of 3/4" o.d, 5/8" i.d. vinyl tubing. It fits perfectly on the pump hose. Remember that this machine is powered by 2 AA batteries. There is not enough power in the pump to move water from the tank to high places. It is perfect for normal use around waist to chest hight. So, the total price for this back saving water machine was $45.97 with my Prime Membership. We'll see how the tank and pump hold up over time but so far it has worked like a charm. Compare this balcony garden with sub-irrigated planters (now supported with a water machine) to "dumb" clay pots dripping water on the neighbors below. This is urban gardening for today rather than horse and buggy days. This shows the water machine and a light garden just inside the sliding door to the balcony pollinator garden. I staged this photo to show the machine and light garden. It is not the method I use for sub-irrigated indoor planters (SIPs) without overflow drains. The indoor method is based on measuring the soil moisture with a scale. I will show the exact setup in a future post within a week. What the photo does show is that the new urban greenscaping studio has both a summer and winter garden. The pollinator garden (all annuals) is still going strong but will soon be history after the first frost. Then the winter view will be of a desert garden and coffee plantation. "Let it snow! Let it snow! Let it snow!" Back in July of 2011 I wrote about a Toronto rooftop garden that converted to sub-irrigated planters (SIPs) inspired by Inside Urban Green. It was great to see that Johanne Daoust and her rooftop garden have recently been recognized with a well-earned design award. I do not know of any other gardener who has embraced technology so well in growing food at home. Johanne has no hesitation in trying something new to improve the productivity of her garden. It is pertinent to mention that Johanne is not in the horticultural business. She is a college professor teaching graphic design. What she has done has been during a time when U.S. consumer gardening education is stuck in a bygone era. Most of it is from a time of back to the land and tie-die with the scent of patchouli in the air. You can see many more photos of her garden in Flickr albums dating back to the start of her rooftop garden in 2009. This is how the seating outside Galileo's Cafe used to look. All photos by Bob Hyland. 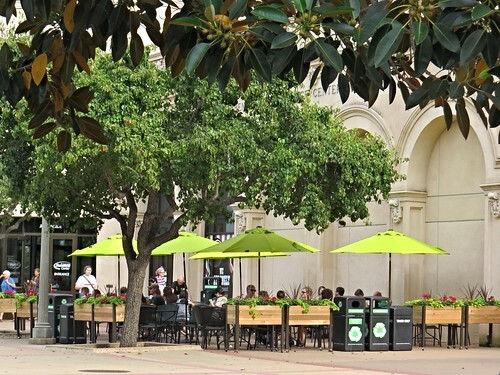 This past August 21st on my daily walk in Balboa Park I discovered an amazing sight outside Galileo’s, the cafe at the Reuben H. Fleet Science Center. 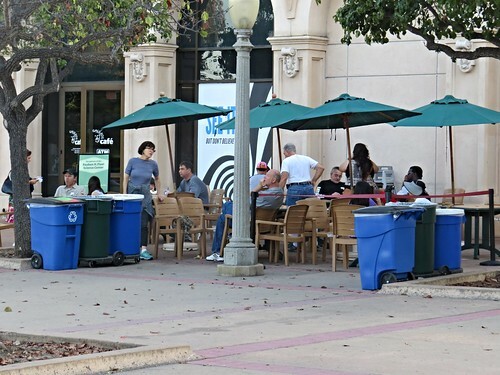 What had been a rather mundane seating area was now a flower garden complete with new umbrella tables and snazzy trash receptacles. I learned that it had all been installed just a couple of hours before I stopped by. There was no construction required. It is entirely portable. I nicknamed it Galileo’s Garden of Discovery. How appropriate that it was created by a science museum. See this Flickr album for many more photos of the garden taken over the past 3 months. I have not had time to edit them. Having been in the plant business for over forty years, I am not easily impressed. I was with what I saw that day. 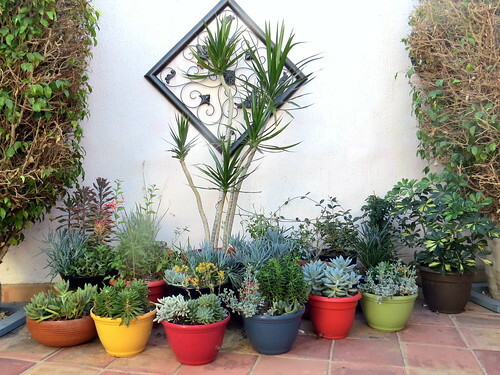 I have not seen a flowering container garden of this quality anywhere in San Diego and wondered who installed such a professional looking project. The big surprise was the answer I got from an email query to the Fleet Science Center. To my absolute amazement I discovered that a Fleet Science Center manager did the job with help from the Galileo staff. This is a D.I.Y project that used readily available components in the hands of highly motivated people. The even bigger surprise is that the rolling planters boxes are sub-irrigated planters (SIPs). Though there should be, there are no other SIPs in Balboa Park. There are none that I know of in the entire city. Further, this fabulous garden is a SIP roll-on, roll off (RORO) garden. Galileo's staff rolls it out in the morning and then rolls it back inside the museum in the evening. How creative! San Diego has an annual Orchids and Onions award program. It just passed in October. I would not hesitate to give this project an Orchid Award. The Fleet Science Center staff manager responsible for the project should be recognized. The Balboa Park Conservancy would be an appropriate organization to do this. Here we are 81 days later and this garden still has flowers though understandably diminished. All the while it has been conserving water as compared to traditional "drench and drain" planters that are the norm throughout the park. SIPs are a passive form of hydroponics that typically saves in the range of 70% of the water wasted by drench and drain irrigation. 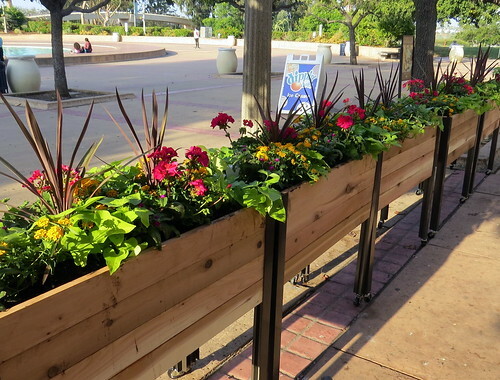 Why is it that SIPs are not the standard for use with any watertight planter throughout Balboa Park and the entire State of California during a drought crisis? The SIP plumbing costs little and works in a wide range of watertight planters from small pots to large raised beds. Who knows how many millions of gallons of precious water are wasted by inefficient drench and drain irrigation? Even the large concrete in situ planters in the park could be converted to SIPs. All it takes is some sweat equity and know-how. 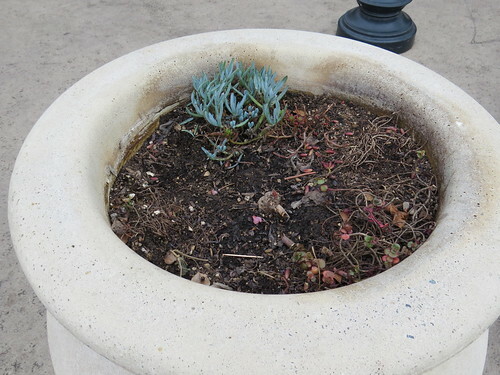 It is appropriate to compare the Galileo’s garden to the 50 urn type planters with succulents in Plaza de Panama that are top watered with a hose. These low water usage plants are in sorry shape. Many have died and many others are half dead. What if all of the planters in Balboa Park were SIPs? 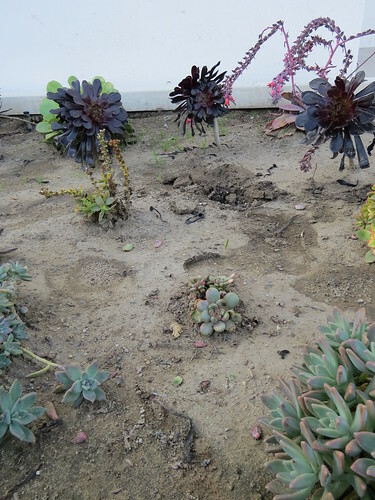 Compare them to this succulent test garden that I installed nearby to the park last year. Unfortunately, neither the San Diego Park and Recreation Department or the myriads of gardening volunteers who flood the park have professional sub-irrigation experience. See more photos of this garden in a Flickr album. I call these "bubble" SIPs because they supply both water and oxygen. They are very easy to make. The simple plumbing made from recycled food containers costs nothing. See the how-to photos in the album. This patio garden was designed for the specific purpose of demonstrating the water conserving benefit of sub-irrigated planters (SIPs). It could just as well have been a more traditional flower garden with displays like the gardens in Buckhannon, West Virginia. Here are some more photos of spectacular flower displays in EarthBox SIPs. Most gardeners use EarthBoxes to grow tomatoes and other fresh vegetables but they work just as well for flowers. You could also grow them in homemade DIY SIPs. The possibilities are endless. All of them are environmentally beneficial when compared to dumb planters with water-wasting drain holes. There is no reason for them, particularly when drought conditions are so widespread. "You sure don't look like one of our kind big fella! And, would you please move out of the way? You're blocking the light for our closeup!" The real back story. This is one of the coffee plants in this post. As the plants grew it turns out that the "big fella" is a pepper plant. The immature leaves look very similar to a coffee plant. Someone in the greenhouse pulled the wrong plant for the coffee pot. Notice that it is flowering. It better be self-pollinating because I don't see any pollinators flying around in my apartment. Notice the white roots, including those growing in the sub-irrigated planter (SIP) reservoir. What you see here is very simple hydroponics. That is what passive sub-irrigation is in reality. It sure isn't "self-watering" the stupid term used most widely in the U.S. It is one of the significant indicators of our dumbed down horticultural education. Even extension program educators with PhD's use it. All they seem to know is old fashioned "drench and drain" watering that is slowly disappearing in most commercial greenhouses. Unfortunately consumers aren't on the memo distribution list with the news about 21st century irrigation methods. When using SIPs indoors it is essential to understand that you should not add water to a planter that still has some water in it from the last refill. To avoid over-watering and root rot, wait until the reservoir is empty and the top 1/2" or so of the soil mix has dried down. The term "self-watering" that encourages constant filling is the cause of most of the negativity about s-w planters that "over water" and are only to be used with "water loving" planters. What crap...but much of the gardening industry is happy because they do not want you understanding and successfully growing plants in SIPs. SIPs mean sustainability, a dirty word to many commercial growers and garden centers. When using SIPs (with overflow drains) to grow edible plants outdoors you can get away with "constant fill" only because of the much higher light under the sun. It is likely to be 100x the light inside your home. Photosynthesis is in full throttle and the plants are using all the water they can get. This shows the two part polyester fabric wick I use in these SIPs made from recycled orange juice bottles. There is a round piece of material inside the planter that covers a hole at the bottom where the threaded part of the neck was cut off. The 2nd piece of wicking is simply laid in the bottom of the reservoir in contact with the inner wick. As you can see, roots soon grow through the fabric and "stitch" the two wicks together. The reason for the wick strip at the bottom of the reservoir is because the bottom of the o.j. bottle is not flat. The 2nd wick ensures that all of the water rises by capillary action and completely empties the reservoir. This is a sharp looking sub-irrigated planter (SIP) from Gardener's Supply. It rocks… and it rolls. I will post about an amazing installation in the coming week. I am flabbergasted at what I have seen monitoring a garden designed with these planters. With about 40 years in the business, I am not easily impressed but I am with the SIP garden I will soon share with you. Stay tuned. Like most of the U.S. gardening trade Gardener’s Supply uses the highly misleading term "self-watering" instead of the accurate horticultural term. We'll forgive them for that because I suppose they must do what they must do to succeed in this market. We are the predominant user of this inaccurate term in the entire world. I see its use as a clear reflection on the quality of our consumer gardening education. Putting semantics aside, what would we do without Gardener's Supply? A product line of sub-irrigated planters like theirs is highly unique. Products like theirs, however, should be conveniently available at local stores just like local food and they are not. Gardener’s Supply is sort of our mini Amazon of technology oriented gardening equipment and supplies. However, add shipping costs to their fairly priced but some times pricey products and they're not within financial reach of the mass urban market that is growing by leaps and bounds. Maybe Gardener's Supply should have a Prime Membership like Amazon. Ok, back to the bricks and mortar world. SIPs should be widely available at stores like Lowe's, Home Depot, Walmart, Ace Hardware and your local independent centers like Armstrong but they aren't. The plain truth is that the gardening industry is stonewalling the use of SIPs for selfish reasons. They think in terms of consumption rather than sustainability. Pry the lid off their business and you will discover that it is anything but green. There are unexploited business opportunities here, particularly for entrepreneurs outside of the stodgy gardening industry. With hydroponics coming out of the closet along with lettuce, tomatoes and marijuana, I predict it will happen sooner than later. Go Green Agriculture Founder and CEO Pierre Sleiman, Jr., right, with Garden Fresh CEO John Morberg, and Pierre's father, Pierre Sleiman, Sr., at the Sleiman's hydroponic farm in Encinitas, CA. This is late breaking news about young ag star Pierre Sleiman, Jr,. of Go Green Agriculture. Read on below. It is wonderful to see a son stand on the shoulders of a father who willingly stands in the background. Kudos to both of them. SAN DIEGO, Sept. 28, 2015 /PRNewswire/ -- Two San Diego area farm-to-table innovators are teaming up to provide the freshest possible produce to 13 Souplantation restaurants in San Diego and Temecula. Garden Fresh Restaurant Corp., the parent company of Souplantation and Sweet Tomatoes with headquarters in the Rancho Bernardo area, announces today an agreement with Encinitas based Go Green Agriculture Inc., that calls for Go Green to supply 100% organic lettuce to Garden Fresh's San Diego County Souplantation restaurants. Go Green will begin supplying the locally grown lettuce to the restaurants beginning September 28. Lettuce supplied by Go Green will be used in a favorite lettuce wrap recipe featured for lunch and dinner in area Souplantation's from September 28 through September 30. "Our commitment to farm-to-table freshness is once again bolstered with our agreement with Go Green Agriculture," said Garden Fresh CEO John Morberg. "For nearly 40 years, our restaurants have been bringing farm fresh food to our guests. Now, with Go Green we will have organic lettuce grown literally in our neighborhood in an environment that capitalizes on integrating technology with agriculture for the absolute freshest and highest quality product. The partnership with Go Green supports our 'Discover Fresh' brand revitalization campaign announced late last year, which includes a focus on farm-fresh food and made-from-scratch menu items." Go Green Agriculture Founder and CEO Pierre Sleiman, said, "We're thrilled to begin working with Garden Fresh. We'll be supplying our organic lettuce to Garden Fresh from our organic hydroponic farm in Encinitas. With hydroponic technology, our system uses up to 80% less water than conventional outdoor farms, an added benefit in our current drought situation. We will be delivering fresh organic lettuce to Garden Fresh within hours of harvesting and you can't get fresher than that." 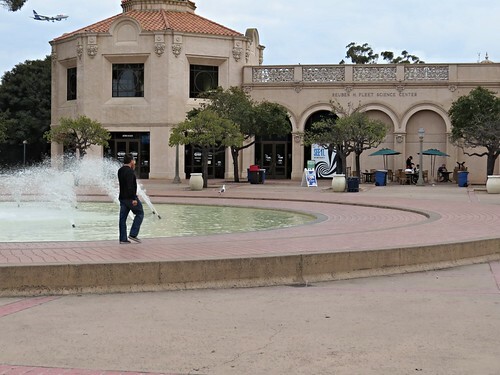 There are 50 olive jar shaped concrete planters in Plaza de Panama at Balboa Park. All of them are planted with succulents. All are watered with a long hose by traditional drench and drain watering. The water flow in the photo above was just a few seconds as the maintenance person moved from planter to planter. In the interior plantscaping business we used to call this type of watering "splash and dash." Due to the drought and watering restrictions there has been far too little "drench" and it shows. The plants have not grown at all since installation. Some are in very bad shape as these photos show. They simply do not get enough water. All of these planters could have been converted to sub-irrigation. Unfortunately no one at Balboa Park knows how to do it. If the planters were SIPs, the succulents would look as good as those at the SIP patio test garden I created last year on a private property very near Balboa Park. 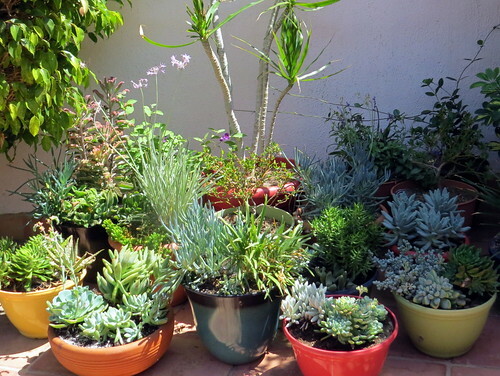 Succulents are categorized as "drought tolerant" but they need adequate water to grow. All of these planters are located in full sun. It is poorly understood that SIPs are rainwater collectors. All of the planter reservoirs would have received a significant refill each time there has been some rain. Instead what little rain has fallen just quickly drained away with little benefit to the plants. These low bowl succulent planters (about 16" dia.) are available at Lowe's here in San Diego for $23. The Mexican clay planters are much more affordable than the high-fired ceramic bowls at Costco. Had they been available last summer, I would have used several of them in the SIP patio garden instead of the colored planters in the front row below. It would have been worth it even having to unplant them to install the bubble SIP plumbing for superior sub-irrigation. Altman Plants is the supplier of the succulent bowls at both Lowe's and Costco (no longer available). They are located here in San Diego County. They call their plants "living treasures". I wouldn't argue with that. It's understandable that succulents are now the hottest plant products here in drought stricken California. What's happening with succulents in your part of the country? Are they widely available? If so, what is the level of quality? Let us all know with a comment below. Here are some more of them at Lowe's. Click on photos to enlarge. Click again for a zoom in view. The plant below is what caught my eye at Costco. It is Euphorbia tirucalli (Fire Plant). These were the only size available at Lowe's (10" pot for $17). I love the architectural qualities of this and other succulent plants. What a cool (or hot) plant it is! Take your pick. When I installed this patio garden in sub-irrigated planters last summer what you see below was what was in my minds eye. It didn't happen because it was not my property. I gave the garden to the owner in payment for storing my plant lab after my donation offer was rejected by Balboa Park management. Foolish decision it was. What a surprise it was last week to find these spectacular succulent bowls at Costco. They were gone in no time at $60 a bowl. That was no surprise. I'm in and out of Lowe's and Home Depot garden centers frequently and have never seen quality succulent planters like these. If I were staying in San Diego and had space I would have bought one, deconstructed it and installed a bubble SIP reservoir like this. It is the method I designed for high fired ceramic planters with a bottom drain hole. Using this method there is no need to drill an overflow drain hole in the side. No easy job with high-fired ceramic planters. I didn't think to find the name of the grower who supplied these planters. It is most likely someone in the local Southern California area. Kudos to the grower for doing an outstanding job of design and installation. All garden centers should be so lucky to have planters like these for sale...with sub-irrigation plumbing of course. Click on photos to enlarge. Click again for a macro view.